Sony SLT Alpha 77 II sensor review: New leader in the ‘semi-pro’ category? High profile sporting events are often used as proving grounds for prototype models from rivals, and whether by design or not, Sony’s introduction of the SLT A77 II coincides with the start of the 2014 World Cup in Brazil. 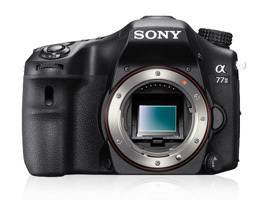 As a revamp of the firm’s popular A77 it’s a camera that should appeal to sports and action photographers. Outwardly the camera resembles its predecessor but the big news is the upgrading of the AF sensor module, which allows the A77 II to rattle off 60 full res JPEGs (Fine L) at up to 12 fps complete now with AF tracking. And, thanks to the so-called translucent mirror technology all this is achieved at same time retaining the live view image using either the built-in hi-res EVF (now 1.23M dot panel up from a 920k dot LCD) or the triple hinged (tilt and swivel) rear LCD. Although the burst rate hasn’t changed over the original, the new wide-area AF array adopts 79 points with 15 cross type sensors but details are still sketchy concerning their suitability using telephoto lenses with a maximum aperture of 5.6, or slower. Like the A77 before it the new model adopts a stabilized 24-Mpix APS-C CMOS sensor, although it’s likely related to that found in firm’s A6000 (minus the on-chip PDAF pixels), along with the firm’s new Bionz X level processor with a new maximum ISO setting up to 51,200. Video includes a 60p option and audio level monitoring but Sony has dropped the useful built-in GPS option found on the A77 replacing it with built-in Wi-Fi communication (complete with NFC) instead. The A77 II is available for pre-order at $1,199 body only or for $1,799 including the 16-50mm zoom. 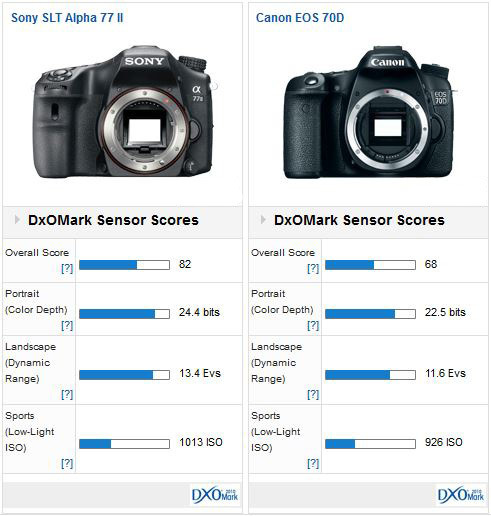 The new sensor in the Sony Alpha SLT A77 II achieved a DxOMark score of 82 points putting it on a level footing with rivals such as the 16-Mpix Pentax K-5 II / IIs and 24-Mpix Nikon D3300 as well as the firm’s Sony A6000. At this level the Sony SLT-A77 II has to compete with some very capable and rightly popular models from rivals. 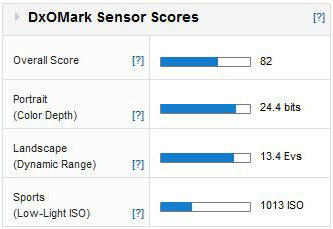 Replacing the aforementioned K5 II and K5 IIs models the higher-res sensor in the Pentax K-3 achieves a slightly lower DxOMark score overall though the difference in real-world terms is negligible. The performance of the 24-Mpix sensor in the D7100 is practically identical as well, so there’s little if anything to choose between them. For the record though the A77 II has a +1/2 stop improvement in color discrimination over the Pentax at base, and that and the Nikon has a slight edge in low-light performance of around +1/3 stop. 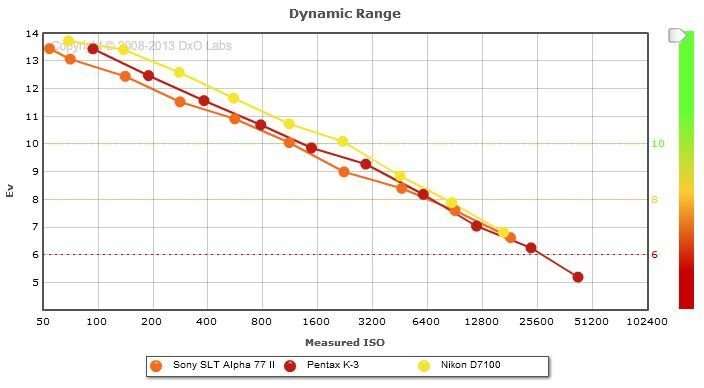 Also although the Sony and Pentax has similar DR to the Nikon that model has an advantage in DR at high ISOs. 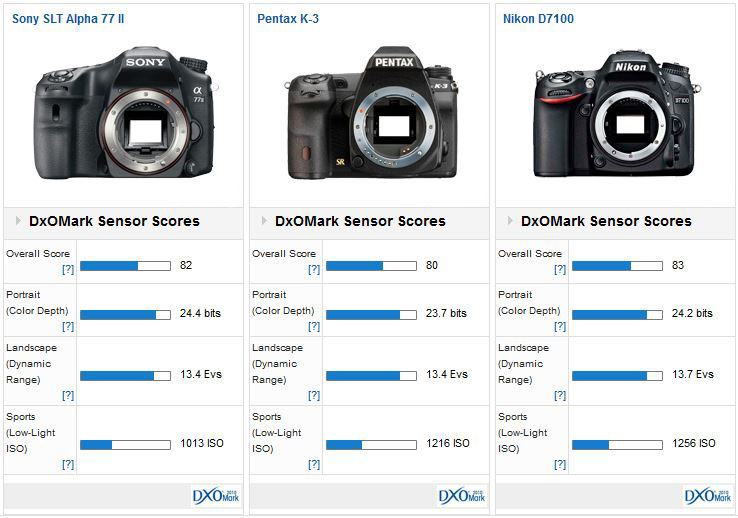 Although the Sony has better color accuracy at base ISO, it performs similarly to the Pentax at higher ISOs. For all that, the Nikon has the advantage at every setting from ISO 200 onwards. The Nikon D7100 also has the advantage in DR ranging from a not insignificant +2/3 to +1 stop between ISO100 to 6400. Although technically the ageing but still hugely capable and popular Canon EOS 7D is the closest to the new Sony, the sensor in the Canon EOS 70D is the latest from the firm. Like others from the firm the Raw data output doesn’t fair that well with rivals in our tests, particularly at base ISO. 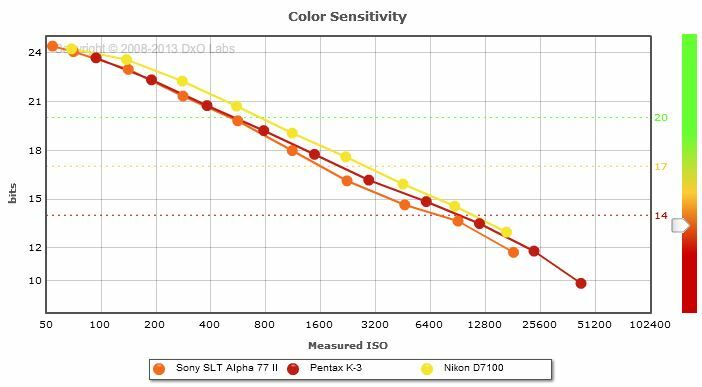 The Sony has +1.3 improvement in color and a sizeable +2 stops wider dynamic range, however in low-light capabilities the two are evenly matched. Against its predecessor the A77 II has some slight gains in color and dynamic range but the most significant advantage is a +1/3 stop improvement in low-light capability, though in real world terms it might be difficult to appreciate. Although Sony is likely to be criticized for removing the GPS function, in just about every other detail the A77 II looks like an attractive update. 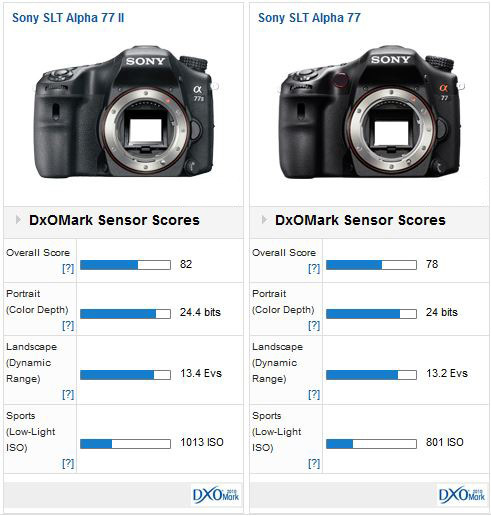 The slight gains in sensor performance over its predecessor are welcome and place the A77 II on a level with rivals. Whether it’s enough to counter as yet unannounced models from Nikon and Canon, however, only time will tell.